How to Print Text Messages from Android. This article provides info on how to print SMS, MMS and text messages on your Android phone over a local WiFi network or a USB connection. The app used for this is Droid Transfer, which enables you print conversations on your phone including images and emojis sent in the messages, as well as dates and times the messages were received, should you need this for your record, or for example for a court case (Can text messages be used in court?). You can download the Transfer Companion App completely free on your phone as below. Droid Transfer is available as a free demo download for PC. 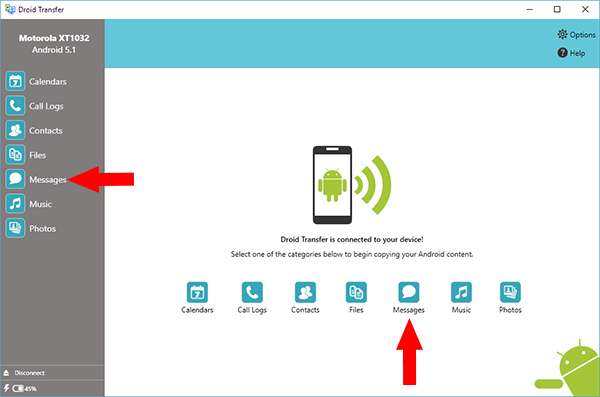 How to Print Text Messages from Android - Run Droid Transfer on your PC and connect to your Android Device running Transfer Companion as described in our Setup Guide. In Droid Transfer Click the Messages Icon - Droid Transfer shows all the text message conversations available on your Android Device. 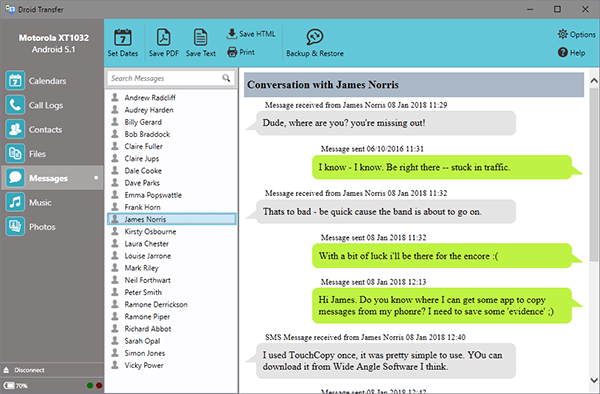 Select the text message conversation you want to print to your PC. Droid Transfer shows all the messages in that conversation. Click 'Print' in the control bar. Your selected text message conversation will now be printed to the printer configured on your PC. When Droid Transfer prints text messages it will include all the images and emojis in your text messages as well.